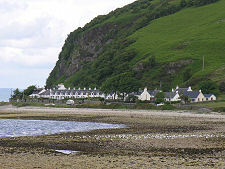 The north west coast of the Isle of Arran is typified by a narrow shelf beside the shore backed by land that rises steeply towards the mountainous centre of the northern half of the island. 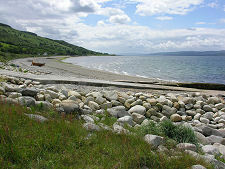 The views here are across the Kilbrannan Sound to the Kintyre Peninsula, and settlement is slight and scattered. 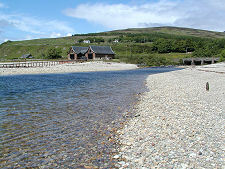 The peaceful and picturesque clachan of Pirnmill is the nearest thing this shoreline has to a village, while further north and much nearer Lochranza is Catacol. 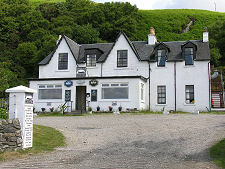 A number of other tiny clachans can be found along this coast, including Dougarie, Whitefarland and Thundergay, but if you blink while driving along the narrow stretch of the A841 that hugs the coast here, you can easily miss them. 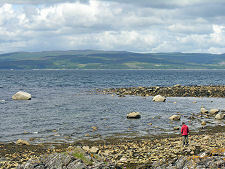 Most place names on Arran can be traced back to Gaelic or Norse origins. Pirnmill is a little different. 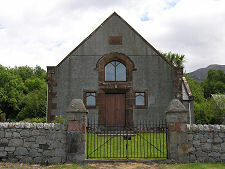 It is named after a pirn mill established here in about 1780 to make use of the power of the fast flowing Allt Gobhlatch as it makes its way steeply from the mountains to the sea. A pirn mill was a mill that made wooden bobbins for the cotton industry, and the mill that was established here was built by J&P Clarks of Paisley, a company that later became part of Coates. For sixty years the mill busied itself producing bobbins for the cotton industry until, in 1840, the exhaustion of all the woodland within economic carrying range of the mill led to is closure. 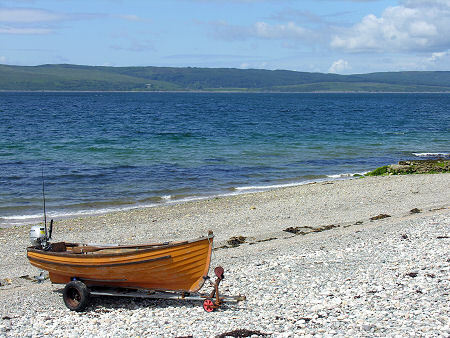 Meanwhile, away of life based for generations on inland subsistence farming turned increasingly to fishing - or to emigration - when the interior of Arran was cleared. 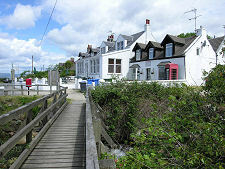 Later, Pirnmill became a stopping off point for steamers bringing holidaymakers to the area and a number of resort facilities were developed including tennis courts and a golf course. These fell into disuse once Lochranza displaced both Pirnmill and Catacol as the destination of choice for steamers to this part of Arran. 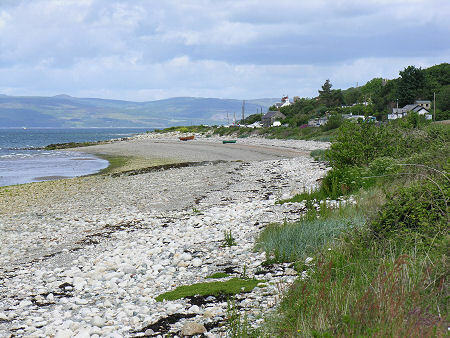 With the development of the car-borne tourist in the last half century, visitors have once more been finding their way to this stretch of coast, though it remains the quietest part of Arran. 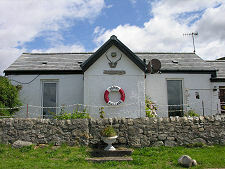 Today's Pirnmill still has a mill cottage alongside the river, while nearby is the Lighthouse Restaurant and a bunkhouse, plus a village shop and post office. Catacol stands on the north side of the mouth of the steep-sided Glen Catacol. This time the name does have a more typical origin, coming from the Norse for valley of the cat. Apart from the Catacol Hotel, Catacol's most striking feature is the row of cottages known as the Twelve Apostles. These were built in about 1850 as homes intended to rehouse people cleared from their inland homes to make room for sheep and deer. 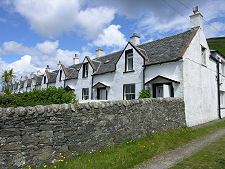 There was considerable resistance from people who preferred emigration to being forced to make a living from fishing, and the cottages, sometimes also referred to as hungry row, stood empty for some time after they were built. Catacol has in more recent times become known as home to three of the world's rarest and most endangered tree species. A National Nature Reserve in one of Glen Catacol's side glens is home to some 300 Arran Whitebeams (Sorbus arranensis), and over 200 Cut-leaved Whitebeams (Sorbus pseudofennica). This is a large part of the total world population of species which, apart from a few kept elsewhere for conservation purposes, are only found on Arran. And in 2007, it was announced that the only two known examples of a distinct new species, the Catacol Whitebeam (Sorbus pseudomeinichii), had also been found in Glen Catacol. 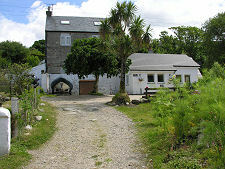 It is perhaps as well that the pirn mill established in 1780 was in Pirnmill and not Catacol.